Modern Times Helpline Pharma are the leading suppliers, exporters, dealers of Deferasirox Tablets at very cheapest and reasonable price in Delhi-India. Deferasirox. Deferasirox (marketed as Exjade, Desirox, Defrijet, Desifer, Rasiroxpine and Jadenu) is an oral ironchelator. Its main use is to reduce chronic iron overload in patients who are receiving long-term blood transfusions for conditions such as beta-thalassemiaand other chronic anemias. deferasirox tablets in india, deferasirox tablets cipla, deferasirox side effects, deferasirox tablets for oral suspension, deferasirox generic, deferasirox solubility, deferasirox innovator, deferasirox interactions,Deferasirox suppliers India, Deferasirox Exporters China,Deferasirox Dealers Russia, Deferasirox Online Price Delhi. Find the best Suppliers, Exporters, Wholesellers, Dealers of Anticancer, Hepatitis C, HCV, HIV, Oncology Medicines in India, Russia, China. Description - The Brand name of this medicine is Desirox. Desirox medicine contains generic Deferasirox. Deferasirox available in form of Tablets. Each film coated Tablets contains 500Mg Deferasirox. One Pack of Desirox contains 30 Tablets. Manufacturer and Marketed company name of Cipla Pharma Ltd, India. USED - Desirox-500 Tablet is used to treat an excessive accumulation of iron in the body due to multiple blood transfusions. Warning: Desirox medicine out of the reach and sight of children and away from pets, never share your medicines with others, and use this medication only for the indication prescribed. The information contained herein is not intended to cover all possible uses, directions, precautions, warnings, drug interactions, allergic reactions, or adverse effects. Description - The Brand name of this medicine is Desifer. 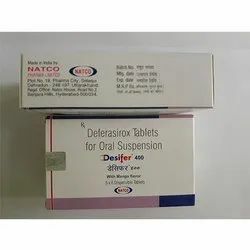 Desifer medicine contains generic Deferasirox. Deferasirox available in form of Tablets. Each film coated Tablets contains 400Mg Deferasirox. One Pack of Desifer contains 30 Tablets. Manufacturer and Marketed company name of Natco Pharma Ltd, India. USED - Desifer 400mg Tablet is an medication to bring under control high levels of iron in the blood. Warning: Desifer medicine out of the reach and sight of children and away from pets, never share your medicines with others, and use this medication only for the indication prescribed. The information contained herein is not intended to cover all possible uses, directions, precautions, warnings, drug interactions, allergic reactions, or adverse effects. Description - The Brand name of this medicine is Asunra. 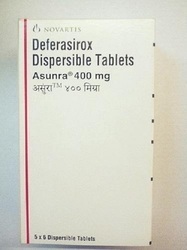 Asunra medicine contains generic Deferasirox. Deferasirox available in form of Tablets. Each film coated Tablets contains 400Mg Deferasirox. One Pack of Asunra contains 5 x 6 Tablets. Manufacturer and Marketed company name of Novartis, India. USED -Asunra 400 mg Tablet is used to treat an excessive accumulation of iron in the body due to multiple blood transfusions. Warning: Asunra medicine out of the reach and sight of children and away from pets, never share your medicines with others, and use this medication only for the indication prescribed. The information contained herein is not intended to cover all possible uses, directions, precautions, warnings, drug interactions, allergic reactions, or adverse effects.